A new three storey office building located within the Cambridge Research Park for use as a regional headquarters on behalf of Kier Eastern. The landscape treatment integrates the site into the wider Research Park, providing office staff with access to a cafe as well as the landscaped areas of the park, including lakes and boardwalks. One of Indigo’s directors was involved with the original park landscape design in previous employment, almost 20 years ago, so it has been especially rewarding to continue our involvement at the site. 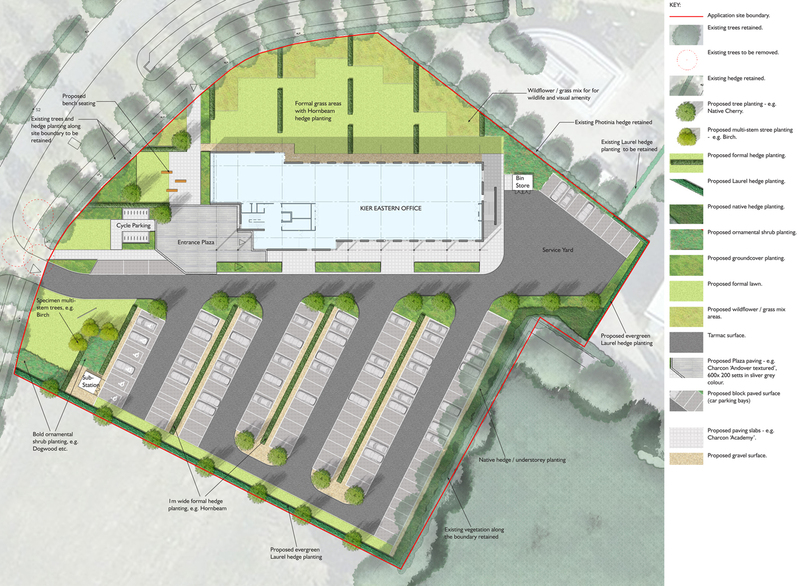 The design of the landscape setting for the new building is bold, simple and biodiverse, incorporating a structure of trees and hedges, with lawns, wildflower meadows, and ornamental shrub planting. Both hard and soft landscape elements use materials carefully selected to provide a strong, simple unifying character, within tight cost constraints.